A.J. Dillon and the Eagles played at Fenway Park and now will play at Yankee Stadium. 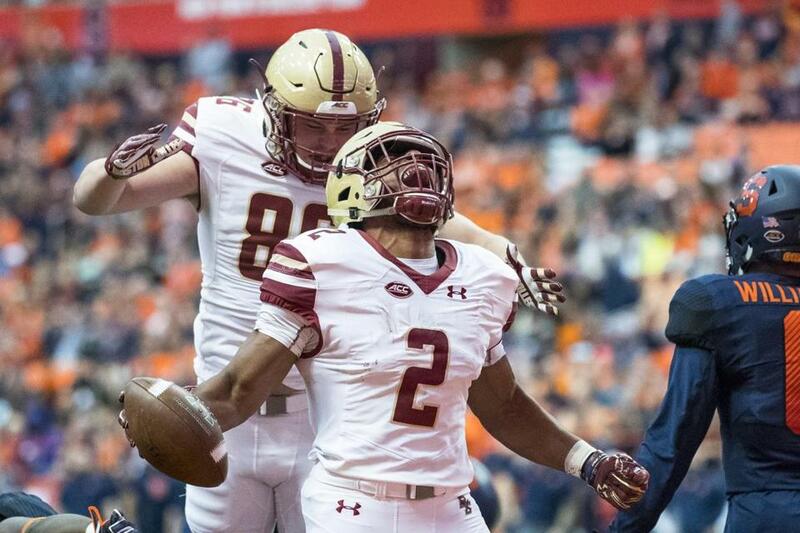 The lobbying for a bowl invite started long before Boston College’s season, coming back in July in the hallways and ballrooms of the Charlotte Westin during the Atlantic Coast Conference media days. Whenever Eagles coach Steve Addazio ran into Mark Holtzman, the executive director of the Pinstripe Bowl, he made sure to casually and jokingly pitch his program. The Eagles had been to the Pinstripe Bowl in 2014, Addazio’s second season as head coach. They experienced the uniqueness of playing a postseason game at one of major league baseball’s most luxurious and historic ballparks, Yankee Stadium. They also reaped the benefits of playing a bowl game within reach of so many of the school’s alumni. Midway through this season, it didn’t seem as if Addazio’s playful pitches mattered. The Eagles were sitting at 2-4 with injuries ruining the roster, and a bowl seemed out of reach. But after ripping off wins in five of their final six games, salvaging their season and breathing life into the program, the Eagles became bowl eligible for the fourth time in five years. The seeds that were planted before the season blossomed Sunday into an invite to the Pinstripe Bowl on Dec. 27 to face Iowa. The game between the 7-5 teams will kick off at 5:15 p.m. It seemed outlandish at the time, but the Eagles tilted their glass from half-empty to half-full with consecutive wins over Louisville, Virginia, and Florida State. One of the most significant factors in their turnaround was the emergence of running back A.J. Dillon, who set BC’s freshman record with 1,432 yards rushing, to go with 13 touchdowns. Dillon earned ACC freshman of the year honors, along with an All-ACC first-team nod. “I think the way I looked at it from the beginning was I always believed in our football program,” Addazio said. “I had some commentary that got picked up on, but I always had confidence in where we were and where we were headed. We had to overcome a bunch of adversity is what we had to do with the loss of a lot of players. Athletic director Martin Jarmond thew his confidence behind Addazio, having watched the way he handled the ups and downs of the season. “The one thing I can say about Steve is he’s so passionate and he cares,” Jarmond said. “I never questioned once our commitment to doing the work. It’s like anything: You put in work, you put in time, and you don’t always see the results that you want, but you trust the process, you trust what you’re doing. The Eagles are 14-11 in bowl games. Last season, they beat Maryland, 36-30, in the Quick Lane Bowl for their first bowl victory since 2007. The Pinstripe Bowl gives the Eagles a chance to win six of their final seven games for the first time since 1993.